Owner Geoff Pearson says Knickers is a "stand-out steer" — and it's hard to miss why. This huge bovine specimen stands head and shoulders above other cows. Owner Geoff Pearson says Knickers is a "stand-out steer" — and it's hard to miss why. 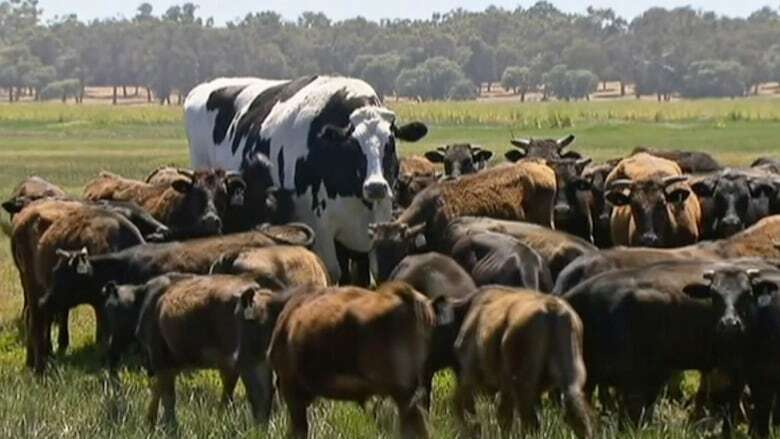 The black-and-white Holstein Friesian has risen to fame after a photo surfaced of the 194-centimetre (6-foot-4) steer standing head and shoulders over a herd of cattle in Western Australia. The young cattle that Knickers is surrounded by in the now-viral photo are Wagyu, a breed of cattle that normally only grow to 1.4 metres. "He always stood out from the rest of the pack," Knicker's owner and the manager of Lake Preston farms in Myalup, Australia told As It Happens guest host Susan Bonner. 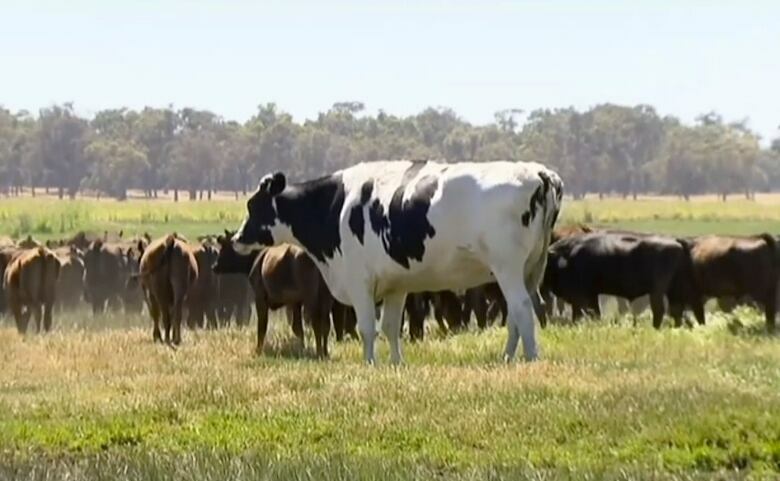 The Australian Broadcasting Corporation reports the seven-year-old bovine is believed to be the tallest steer in the country and weighs about 1.27 tonnes (1.4 tons). The steer is almost as tall as Michael Jordan and weighs the equivalent of 4,000 hamburgers. Knickers is a "coach" steer — a bull that has been castrated and whose job is to "steer" young cows, known as weaners, who have recently been weaned from their mothers. "When we want these weaners to come into the yard, we point Knickers in the right direction and away they go," Pearson said. Pearson says Knickers's size is most likely due to genetics and his time spent with the young cows. "I'm guessing Knickers has spent a fair bit of time eating what the weaners would normally be eating," Pearson said. "He's been supplemented to his benefit." Knickers got his name from a friendship he had with another steer. Pearson said in Knickers' early days at the feedlot, he was friends with a Brahman steer named Bra. "Bra and Knickers," Pearson said. While most steers are eventually sent to slaughter, Pearson decided to keep Knickers around a bit longer because of the steer's extraordinary size. Then, last month, Pearson tried to put Knickers up for auction as part of a charity drive to help drought-stricken farmers in Australia's East. The problem was, no slaughterhouse could handle him. "He was just simply too big to process," Pearson said. Now, Knickers will spend the rest of his days in Pearson's feedlot where "he's always got a crowd around him." "Knickers lives on," Pearson said. Written by Sarah Jackson with files from Associated Press. Produced by Ashley Mak.